And your earrings turn into a luxurious eye-catcher in an instant. Two very different pairs of earrings for the price of one. 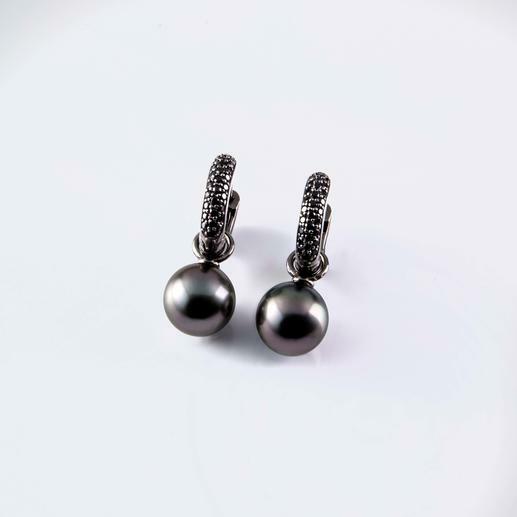 What’s more, Tahitian cultured pearls are rare and precious. You can easily pay £450 elsewhere for simple pearl earrings of a comparable quality. However, with these spinel creole earrings you’ll have a second pair for free. Creole earrings made of 925 silver, black rhodium-plated. Width: 3.5mm, outer diameter 15mm. Weight earrings 1.8g (0.06 oz), with pearl approx. 3.7g (0.13 oz).